Some people have way too much time on their hands. Way too much. And what do they do with that time? The start messing with perfectly good motorcycles and turn them into something they were never designed to be. But then I guess it's art, and art is in the eye of the beholder. Here are 51 weird and definitely different motorcycles. Riders Asked to Oppose Motorcycle Checkpoints: "The AMA is urging riders to contact Georgia Governor Nathan Deal to urge him to stop the Georgia State Patrol from conducting motorcycle-only traffic checkpoints." This is the attitude you develop as a Ducati rider. Long live the grandfather from the UK! Biker Died 3 Times, 38 Operations, But Still Wants To Ride: "
How much do you love your motorcycle? Gary, a grandfather from the UK, had a terrible accident with his Ducati motorcycle. He died 3 times, but was revived. He had to undergo 38 life saving operations to function normal again. He's in a wheelchair, but he's already thinking about his next motorcycle. 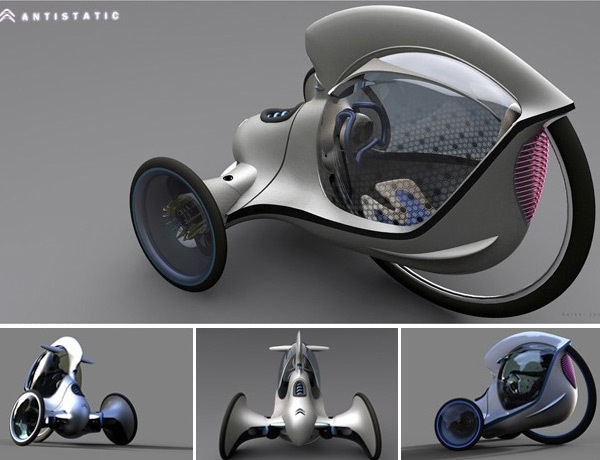 Antistatic E-3POD concept wins Citroen design award, job for its student creator: "
Who says dreaming doesn't pay? A young designer by the name of Heikki Juvonen recently won himself a six-month job placement at Citroen's PSA Design Centre in Paris after producing the most compelling response to the company's Double Challenge set to students at London's Royal College of Art. The premise was simple -- put together an aesthetic for an ultra-compact urban vehicle that Citroen could call its own, and judging by the imagery above, we can all probably agree that Heikki achieved a very distinctive look with his E-3POD. We're not yet certain how we feel about being inside the largest of the three wheels for the duration of our electrically powered journeys, but the young gent has half a year on his hands to tweak and refine his eye-catching design. We'll be ready to test-drive the prototype as soon as Citroen becomes mad enough to build one. Antistatic E-3POD concept wins Citroen design award, job for its student creator originally appeared on Engadget on Mon, 21 Feb 2011 05:52:00 EDT. Please see our terms for use of feeds. Permalink Translogic, Carscoop | Heikki Juvonen | Email this | Comments"
Unbelievable! A part 4 to this series. 50 Weird, Wacky and Wonderful Motorcycle Trikes - Part 4: "
Part 4 (the last one for a long time) of 4 articles showing 50 really weird, wacky and wonderful motorcycle trikes. The 10 Most Expensive Motorcycles in the World: "
Got a few gazillion bucks burning a hole in your biker wallet, or just wanna dream? If you were made of silly money, you'd forget off-the-shelf superbikes and scoff at run-of-the-mill cruisers, opting instead for wild options that constitute this list of the world's priciest production motorcycles. The list includes everything from a carbon and kevlar-tanked, supercharged naked bike to a ride that incorporates a particularly effective use of a helicopter turbine engine... so without further ado, here's our list of The 10 Most Expensive Motorcycles in the World. Photo © Ecosse; click for 10 Most Expensive Motorcycles"
Real GPS HUD Info For Any Motorcycle: "
Using Augmented Reality with an Android's smartphone camera, GPS navigation software and the Follow Me app from Route 66, you can now safely use this GPS on your motorcycle. When you look at the phone for instructions, you still get to see the road ahead of you, and to make matters easier, all you need to do is 'follow' the virtual vehicles in front of you. Enormous Solar Flare Set Will Cause Massive Communication Disruptions Tonight [Space]: "
I didn't realize there would be a Part 3 to this series. 50 Weird, Wacky and Wonderful Motorcycle Trikes - Part 3: "
Part 3 of our listing of weird, wonderful and/or wacky motorcycle trikes. They come in all shapes and sizes, some more weird than others. I'm re-posting this as a public service announcement. Geez! She Is Heavy: "
This motorcycle, so far, is universally loved by the motorcycle press. But every photo I see of it makes me think U-G-L-Y. Maybe I need to see it in person...maybe I need to ride it? 2011 Ducati Diavel Review: Riding Ducati's Diabolical Power Cruiser: "
One thing you need to know about so-called power cruisers like the Harley-Davidson V-Rod Muscle, Star V-Max, and Suzuki M109R: they may be quick in a straight line, but they also weigh between 673 and 764 pounds apiece-- yep, that's some serious peg-scraping tonnage. Ducati's new 162 horsepower Diavel? Well, the Italian company won't release wet weight figures, but considering its dry mass is a featherweight 463 pounds (or 456 pounds for the Carbon edition), I'd confidently say the Diavel offers a mind (and genre) bending experience for anyone who's ever wanted to break the sound barrier, yet failed to see the attraction behind torture rack sportbikes. After blasting the Diavel through mountainous roads in Southern Spain, I'm hesitant to even use the word cruiser in the same sentence... what exactly am I talking about, and why the rampant hyperbole? Find out in my 2011 Ducati Diavel Review, and see pics of the bike in this photo gallery. Price Hikes For Raw Material: Expensive Motorcycles? Price Hikes For Raw Material: Expensive Motorcycles? : "
Prices are going up, and will not come down anymore. And it's not just petrol, though we'll be seeing enormous price hikes win before the end of 2012, with peak oil production being reach by the end of next year. Other raw materials, like rubber are going to go through the roof. Already most tire manufacturers have announced price hikes of 8%, and more to come. But iron is going up 30% this year. Our beloved motorcycles are going to be more expensive to buy, and much more expensive to run. Brazil: Government Trying To Outlaw Motorcycle Taxi: "
The Brazilian government is trying to legislate motorcycle taxis to such an extent that they would have to disappear. 31% of all fatal accidents in Brazil involve motorcycle, so they are deemed a 'public health' problem. Why do we have some many idiots.. and why are they almost always politicians? Would you hop on a 2-wheeled taxi? Motorcycle Taxi Meters Coming? : "
A great idea whose time has come! Two American expats living in Thailand have created the world's first motorcycle taxi meter. No motorcycle taxi have fare meters. The device just don't exist since traditional cage taxis meters don't work on a bike. So they developed a high tech one that looks great. It's equipped with an onboard GPS, it offers geographical proximity advertising and it has a black box feature that will provide an extra safety bonus for the passengers. All that for an attractive price that even Asian and African motorcycle taxis should be able to afford. Lot's of interesting data in the posting below. I'm always of mixed mind about this: on the one hand, an increase in motorcycle production is good for the industry and means motorcycles will continue to be around; on the other hand, it means more and more riders are on the road. Japan Has First Increase in Motorcycle Production in 4 Years: "It wasn't much, but it is an increase and hopefully a sign of things to come in 2011." 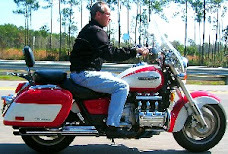 Here's the requisite part 2 of the trikes post from Motorbiker.org. My favorite in this list is #63. 50 Weird, Wacky and Wonderful Motorcycle Trikes - Part 2: "
Part 2 of weird, wacky and wonderful motorcycle trikes. There are many weird ones, but also some pretty ones out there. Daytona Bike Week 2011 at The Broken Spoke Saloon: "
(Daytona, FL --- February 3, 2011) The Broken Spoke Saloon in Daytona will be the place to be March 4th - 12th for DAYTONA BIKE WEEK 2011. This year’s event is filled with a great lineup of acts paying tribute to rock and roll’s elite, along with a mind-blowing set of motorcycle events. The Broken Spoke Saloon in Daytona is located at 1151 North U.S. Highway 1 in Ormond Beach. Another indicator that gadgets, technology, and motorcycles are on some horrible collision course. Agility Saietta electric sports bike eyes-on: "
We came, we saw, we took pictures. 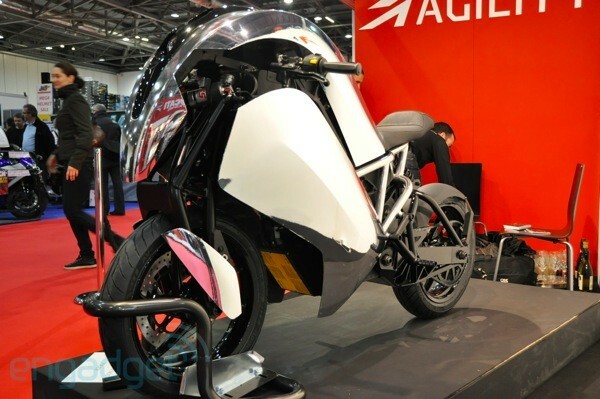 A London-based startup by the name of Agility today unveiled its first and only product, the Saietta electric sports bike, and we just had to pop out to the MCN Motorcycle Show in its hometown to peep it for ourselves. Well, what is there to say that the pictures don't already? We should probably start off with that massive hump you see up front. At first glance it makes the bike look extremely front-heavy, but it is in actual fact mostly a shell -- made of a lightweight composite material whose ingredients we were not allowed to know -- which channels air into the areas that need cooling and, more importantly, optimizes the hell out of this two-wheeler's aerodynamics. There's an exposed double wishbone suspension system, just some of the eye candy on this extremely reflective racer, and the weight balance is, contrary to our first impression, almost perfectly even. This is due to the battery packs being stashed in the center, just in front of a brushed DC motor with 90+ percent efficiency (Agility tells us the whole roaring machine has an 83 percent throughput efficiency). There will be a choice of body panels, we saw a highly reflective chrome one, but a tamer red version is also available. Speaking of colors, the tiny speedometer lights up in a snazzy blue for night riding. We were looking at only the company's third production prototype, but pre-orders are already being taken -- at prices of just under £10,000 for the S model with a 50-mile range and just under £14,000 for the R variant that has a twin battery pack and, correspondingly, can stretch out to 100 miles -- for an April delivery. US pricing is said to feature a "slight" premium, but Agility hopes it may be able to build some of these Saietta bikes over on the West Coast, potentially cutting into the expense of selling them in North America. The only thing our pictures don't reveal is how a bike with instant torque and a four-second 0-60 acceleration (on the lighter S model, the R does it in five) feels like, but if we're really good over the next few weeks, we might just get a chance to ride one and find out for ourselves. Agility Saietta electric sports bike eyes-on originally appeared on Engadget on Thu, 03 Feb 2011 14:56:00 EDT. Please see our terms for use of feeds. Photo Gallery: New 2011 Harley Davidson 1200 Custom Ups the Options, Rings in at $10,299: "
Harley-Davidson's 1200 Custom is a mid-year addition to the 2011 lineup (like the just-announced Blackline) that's either music to the ears of budget-minded buyers, or yet another reason to slam Harley for re-shuffling styling cues and heralding a so-called new bike. Launching Harley's new 'H-D1' customization program, the 1200 Custom starts at $10,299 and aims at empowering buyers by offering seven ways to switch-up the bike's setup. Wheels, handlebars, seats, paint, foot control position, security system, and engine finish can be optioned, ranging from zero dollars (for a solo seat) to $640 (for multiple option custom paint.) Look past its chunky Michelin Scorcher tires, and you'll find the usual underpinnings, including a 1,200cc v-twin that produces 79 ft-lb of torque, a big 4.5 gallon fuel tank, and a low seat height of 26.6 inches. I'm guessing that though the new 1200 Custom will undoubtedly fuel the fire of H-D critics, it will also bolster the Motor Company's bottom line, given the strong sales of relatively affordably-priced Sportsters of late. But perhaps a deeper question lurks: does Harley have anything more-- um, revolutionary lurking up their sleeve? Take a look at this 2011 Harley-Davidson 1200 Custom Photo Gallery, and share your thoughts. Check out the cool V7 Scrambler by Moto Guzzi. Moto Guzzi California & V7 Scrambler Debut: "Moto Guzzi reveals California and V7 Scrambler prototypes at the Piaggio dealer meeting January 27-28 in Monte Carlo."